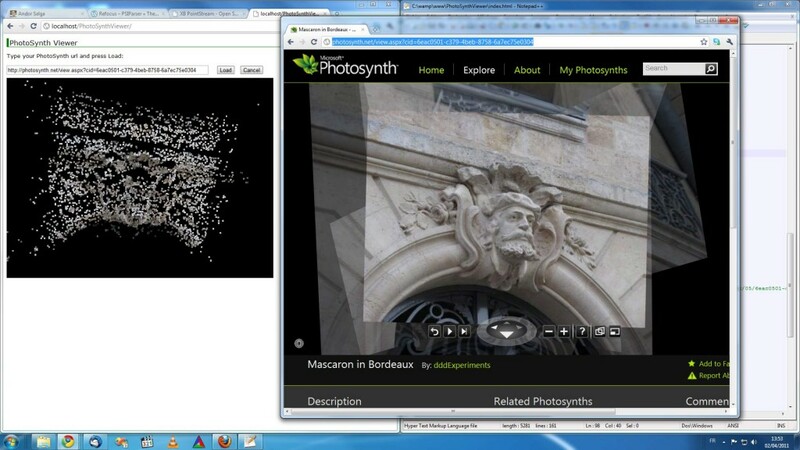 XB PointStream: WebGL point cloud viewer. jDataView: JS class that enable to “parse” binary buffer. The source code of my extension should be available soon on my GitHub (with an html page working with Firefox 4 and Opera 11.5 using a PHP proxy to fix ajax cross-domain security issue). The Google Chrome extension is available for free on the Chrome Web Store. Warning: I’ve released this extension without Microsoft approval so if they don’t accept it, I will remove it immediately. Use Web Workers to parse file in a background thread. Display cameras positions and orientation as in my Ogre3D Viewer. Display Bing map on the ground if the Synth is geo-referenced. Display the collection of picture and if you click on one, animated the 3d camera to the corresponding viewpoint. …and find it useful, your help will be appreciated . The PayPal donate button is on the sidebar on the right. Thanks! First of all, I’m sorry this post is not about CMVS support in PhotoSynthToolkit . Releasing the PhotoSynthToolkit with CMVS support is way more complicated than predicted… This is because it is not just a file conversion process (as in my PhotoSynth2PMVS). I have designed a library (OpenSyntherLib) that extract features, match them, build tracks and then triangulate them using PhotoSynth cameras parameters. The problem is that this library is highly configurable to match each dataset needs. So providing an automatic solution with good parameters is difficult. The new PhotoSynth2CMVS tool generates bundler-compatible file (“bundle.out”). I’ve sent the bundle.out file of the V3D dataset to Olafur Haraldsson and he has managed to create a 36 million vertices point cloud with it! It will be showcased in a next post. The viewer source code will be hosted on my GitHub and I’m working on a Google Chrome extension to by-pass the need of a proxy… Having a Google Chrome extension that replace the Silverlight viewer on photosynth.net would be nice too (if you don’t have Silverlight). You are currently browsing the archives for April, 2011.